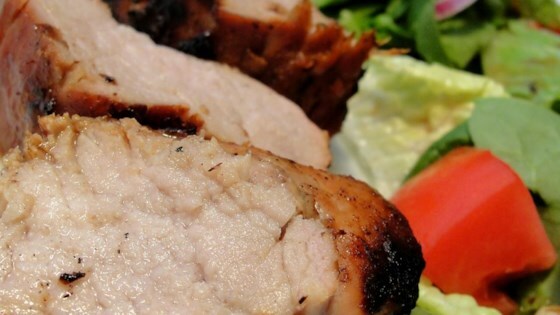 "A slightly sweet marinade that makes for the best tasting pork you will ever have." Place soy sauce, brown sugar, sherry, dried onion, cinnamon, olive oil, and a touch of garlic powder in a large resealable plastic bag. Seal, and shake to mix. Place pork in bag with marinade, seal, and refrigerate for 6 to 12 hours. Lightly oil grate. Place tenderloins on grill, and discard marinade. Cook 20 minutes, or to desired doneness. Slice into medallions, and serve. My family thought this recipe was okay, but nothing outstanding. We will not likely make it again. I tried this recipe and loved it, we baked it and substituted balsamic vinegar for the sherry. It was fabulous!! Not one leftover! Thanks! !